It was Festive Fun, accompanied by liquid punch, mince pies and shortbread biscuits, at the December Todmorden U3A general meeting with Mad Hatter Illuminations, aka Maurice Heath and Judy Heath, topping the bill. Before putting on a Punch and Judy show they enlightened their audience with the history of this traditional entertainment. Maurice explained that it had its roots in ancient Greece, where mood in drama was represented by the two masks of comedy and tragedy. Archaelogical evidence has led to conjecture that actors travelled to take a lighter form of theatre beyond the confines of the city of Athens. Mime was part of theatre and was taken back to Italy, where it flourished, after the Romans conquered Greece. It was here in Italy that came the beginnings of Punch and Judy as we know it, originating in commedia dell’arte and the character Pulcinello. It travelled to France and from there to Britain. Pulcinello and the other characters started as marionettes and Pepys made reference in his diary to seeing this marionette show. For much of its history, it was an entertainment for adults, with political and economic commentary on the affairs of the day. Both show and audience were also very raucous. Performers travelled the country visiting the local fairs. Transporting marionettes, and the cost of paying several people to operate them, led to the adoption of glove puppets in the latter half of the 18th century. Puritanical attitudes towards actors also allowed puppets to thrive. In the early 19th century Punch and Judy (originally Joan) was very violent, with Judy being beaten and killed by Punch. This was when the show included characters since dropped, Pretty Polly, Punch’s mistress, the Judge and the hangman, Jack Ketch. He is named after the infamous executioner appointed by Charles II. Ketch bungled the beheadings of two aristocrats (commoners were hanged) leading to his name being used as a term for the hangman of the day as well as a character in Punch and Judy. There was no one story and certainly no script until 1828 when a journalist, John Collier, wrote down the scenario as performed by Giovanni Piccini and was published with illustrations by Cruikshank. The show we see in Britain today derives from this. Judy became milder over time, the baby was a toddler in Victorian times, and was always “it”, with no gender ascribed. The dog, another common character, became a live one, providing a greater attraction. It was always a “Yorkie”, the right size and with an amenable temperament. Scaramouche, one of the original characters, developed into a clown. Later in the century, Mr Punch and co. moved into the towns with a show on almost every street corner, catering for people to poor to attend theatre. It was still very flamboyant and Italian in style. The next change came with the railways, Wakes Weeks, and holidays at the seaside to where Punch and Judy migrated. Of necessity, the story changed to accommodate the presence of children and became what it is today. Much of the violence was removed leading to the departure of Pretty Polly – Punch couldn’t have a mistress in a children’s show – the Judge and Jack Ketch, among others. Only the policeman from the realm of law and order remained. Another advance in transport in the 1960s brought about the next change in Mr Punch’s fortunes, cheap air fares and package holidays enabling millions of Britons to holiday abroad. With a decline in audiences at the domestic seaside, he now preforms for children’s parties, in smaller and more portable booths. More recently, political correctness has also had its impact, with the issue of domestic violence much more to the for. Punch and Judy are still making appearances at fairs and fetes, and student unions arrange for the Victorian version to be performed. 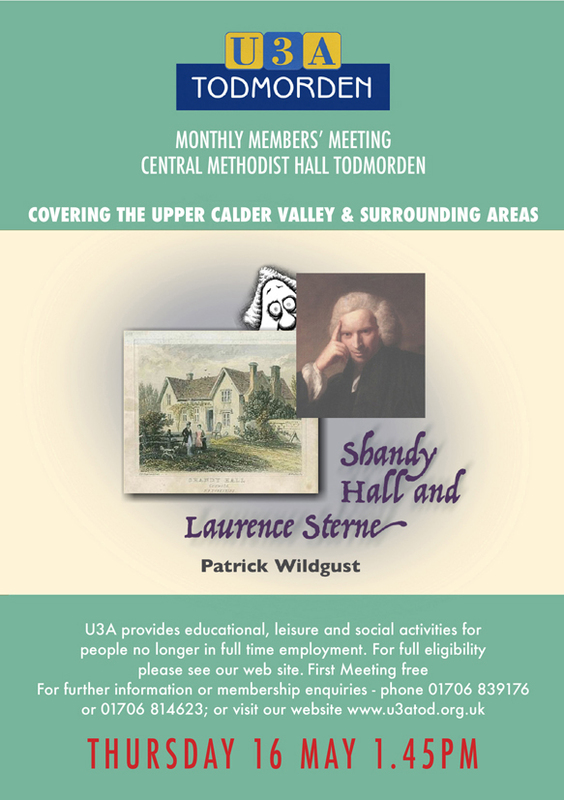 After Maurice and Judy had delivered what was an amusing as well as a fascinating history, U3A members were treated to a short performance, gleefully accepting Judy’s invitation to be six years old again. This led for example, to many cries of “Oh no you weren’t!”, in response to Mr Punch’s protestations of how good he he had been. Peter Carrigan, U3A’s Speaker finder, moved the vote of thanks and presented the customary token. 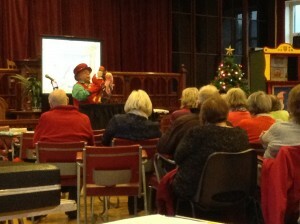 This was followed by a quiz set by Myrna Beet, Denise Wilson, Anne and Colin Crane, and Mary Findon. Then, like all good children after an afternoon of fun and entertainment, members went home tired but happy.